Northrop Grumman in cooperation with the U.S. Navy recently conducted the "first fly-in arrested landing" of the highly coveted X-47B Unmanned Combat Air System (UCAS). 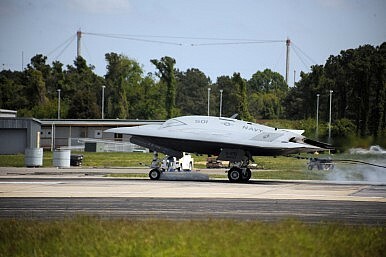 According to Northrop Grumman, the test "represents the first arrested landing by a Navy unmanned aircraft. It marks the beginning of the final phase of testing prior to carrier-based trials planned for later this month." The X-47B is a tailless, strike fighter-sized unmanned aircraft now under development and testing. It is part of the U.S. Navy’s highly touted Unmanned Combat Air System Carrier Demonstration (UCAS-D) program. The aircraft sports a 62-foot wingspan. It is also shaped like a "flying wing." For comparison to other popular aircraft, it is 17 feet wider than the F/A-18 Super Hornet. Reports place the X-47B's top speed in the "high subsonic" range with a maximum capable distance of about 2,100 nautical miles. The X-47B is a prototype designed to fly autonomously. This is different than drones or UAVs that are currently being used by America's military. Such systems are usually flown remotely by ground-station-based military personnel. The aircraft, while not intended for "operational use," is part of a an effort geared toward the development of other unmanned carrier-based aircraft intitatives. Such aircraft with long range that will have the ability to operate from carriers are important. With many nations developing anti-access capabilities with long range missiles that could in theory attack multi-billion dollar carriers, remotely operated aircraft could be a prized asset that could place a carrier out of range of enemy shore based weapons. Even as sequestration cuts into the U.S. military’s budget, new tech continues to roll out.